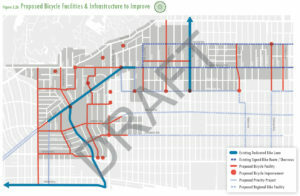 The City of West Hollywood is currently updating its Bicycle and Pedestrian Mobility Plan, which is expected to include new bike lanes and other important improvements. The updated plan will be presented at several meetings in the next few months. The more people that attend these meetings and speak up to support safer, better streets for pedestrians and bicyclists, the better our streets will become. We need your help. Please join us to show your support for bike lanes and other improvements! Then spread the word. Together, we can make a difference! The draft plan can be downloaded here. Please see WeHoBC statement here. Fiesta Hall, Plummer Park, 7377 Santa Monica Blvd. First Floor Community Conference Room, City Hall, 8300 Santa Monica Blvd. Council Chambers, West Hollywood Park, 625 N. San Vicente Blvd. Bicycle lanes on Vista St./Gardner Ave., Holloway Dr., Cynthia St. (west of San Vicente Blvd. ), San Vicente and Crescent Heights Blvds. northbound from Santa Monica Blvd., and Beverly Blvd. Sharrows on Doheny Dr., Robertson Blvd. and Melrose Ave.
Additional neighborhood greenways on Palm Ave./Cynthia St., Huntley/Sherwood/Westbourne Drs., Rosewood Ave., Norton Ave., and Formosa Ave. If you would like to do more to promote bicycle advocacy in this Plan, or in West Hollywood in general, please join us at our meetings on the first Wednesday of each month from 6-8 PM in the Plummer Park Community Center, Art Room 2, 7377 Santa Monica Blvd., West Hollywood.